Want to quickly see how the open-source software InterPhoto Image Gallery works? You'll find a free and updated demo installation of InterPhoto Image Gallery here. We are currently updating the InterPhoto Image Gallery demo. Please check back shortly. There will be a new version up soon. InterPhoto Image Gallery CMS is a free open source content management system built using PHP as a programming language and a MySQL database to store information. It’s mainly directed at websites that display images and is focused on protecting the images on your InterPhoto Image Gallery CMS demo. Some of the features you will find in a demo site are filenames and folder encryption to protect your images, multilanguage support, WYSIWYG online editor, friendly URLs and Smarty templates to change the appearance of your InterPhoto Image Gallery demo. You can download it using the link below to create your own demo site, or you can have a look at the project samples below that show you how a InterPhoto Image Gallery demo looks like. 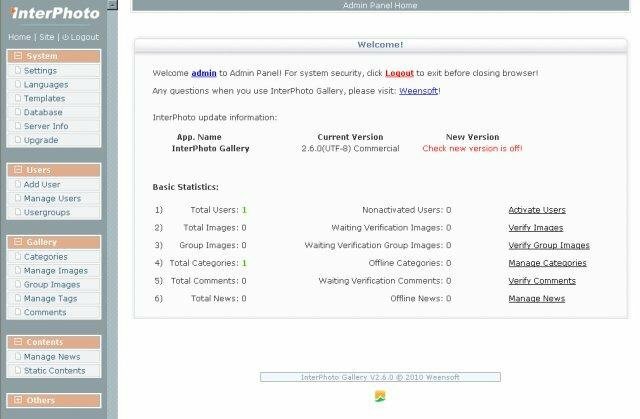 The latest version available for download is 2.5.0 and was released on March 18, 2011.